Retail giant Walmart led the Dow Jones to yet another record high after it announced plans to buy back $20bn of its shares. Walmart also said it expected its US online sales would rise by about 40% in the year to January 2019, while net sales would increase 3%. Shares in the retailer rose 3.4% in early trade, helping the Dow to climb 86 points, or 0.4%, to 22,847. The biggest faller on the Dow was United Health group, down 0.7%. 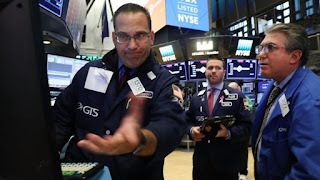 The Nasdaq was also up 0.4%, rising 27 points to 6,607, while the S&P 500 index climbed 4.69 points to 2,549.42.